EAW028474 ENGLAND (1950). The Devon Cleaning Works, Holy Trinity Church and the White City Stadium, Shepherd's Bush, 1950. This image was marked by Aerofilms Ltd for photo editing. 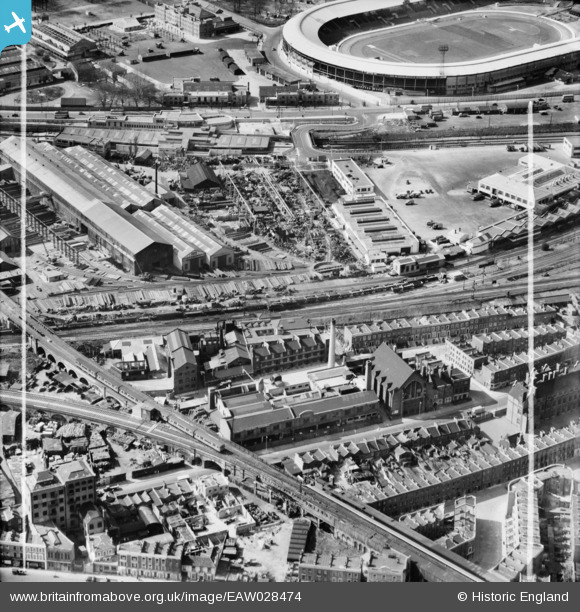 Pennawd [EAW028474] The Devon Cleaning Works, Holy Trinity Church and the White City Stadium, Shepherd's Bush, 1950. This image was marked by Aerofilms Ltd for photo editing. George Cohen & Sons, scrap metal merchants. Electric multiple unit on a London Underground service - District Line? A six car O stock unit on the Hammersmith & City Line just passing the disused junction with the West London Railway near Latimer Road.